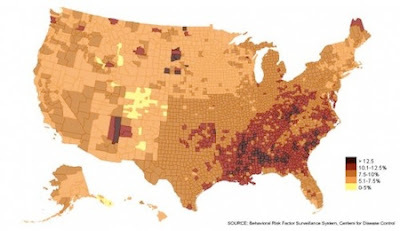 Check out this interactive map of the geographical spread of diabetes in the U.S. since 2004. It's sobering. My mom's family has a history of diabetes. They're also from the northeast corner of Louisiana, not far from the Arkansas and Mississippi borders. I can't say I'm shocked, then, to see that this region is the epicenter of the diabetes explosion in America. By the way, nice job, Colorado. You get a gold star.